It’s about time to import some data into our previously established object scheme. If you want to do this yourself you want to first run the Crunchbase mirroring tool and create your own mirror on your hard disk. In the next step another small tool needs to be written. 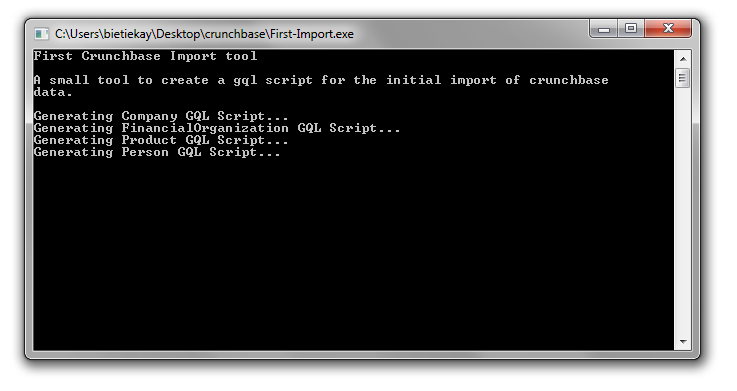 A tool that creates nice clean GQL import scripts for our data. Since every data source is different there’s not really a way around this step – in the end you’ll need to extract data here and import data here. One possible different solution could be to implement a dedicated importer for the GraphDB – but I’ll leave that for another article series. Back to our tool: It’s called “First-Import” and it’s only purpose is to create a first small graph out of the mirrored Crunchbase data and fill the mainly primitive data attributes. Download this tool here. Additionally all edges to a company object and the competition will be imported in this part of the article series. For the most part of the work it’s copy-n-paste to get the first-import tool together – it could have been done in a more sophisticated way (like using reflection on the deserialized JSON objects) but that’s most probably part of another article. The last script is named “Step_3” because it’s supposed to come after all the others. These scripts can be easily imported after establishing the object scheme. The thing is though – it won’t be that fast. Why is that? We’re creating several thousand nodes and the edges between them. To create such an edge the Query Language needs to identify the node the edge originates and the node the edge should point to. To find these nodes the user is free to specify matching criteria just like in a WHERE clause. So if you do a UPDATE Company SET (ADD TO Competitions SETOF(Permalink=’company1’,Permalink=’company2’)) WHERE Permalink = ’companyname’ the GraphDB needs to access the node identified by the Permalink Attribute with the value “companyname” and the two nodes with the values “company1” and “company2” to create the two edges. It will work just like all the scripts are but it won’t be as fast as it could be. What can help to speed up things are indices. Indices are used by the GraphDB to identify and find specific objects. These indices are used mainly in the evaluation of a WHERE clause. The sones GraphDB offers a number of integrated indices, one of which is HASHTABLE which we are going to use in this example. Furthermore everyone interested can implement it’s own index plugin – we will have a tutorial how to do that online in the future – if you’re interested now just ask how we can help you to make it happen! Looks easy, is easy! To take advantage of course this index creation should be done before creating the first nodes and edges. After we got that sorted the only thing that’s left is to run the scripts. This will, depending on your machine, take a minute or two. That’s it for this part – in the next part of the series we will dive deeper into connecting nodes with edges. There is a ton of things that can be done with the data – stay tuned for the next part.